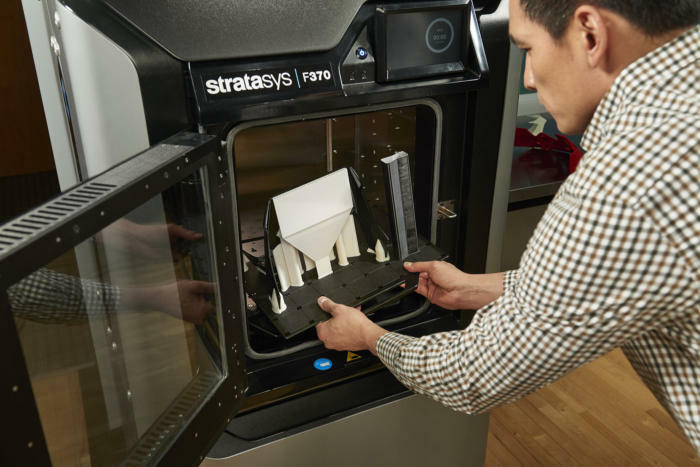 3D printer maker Stratasys Ltd. today unveiled a new line of professional 3D printers for use by design workgroups that do rapid prototyping. 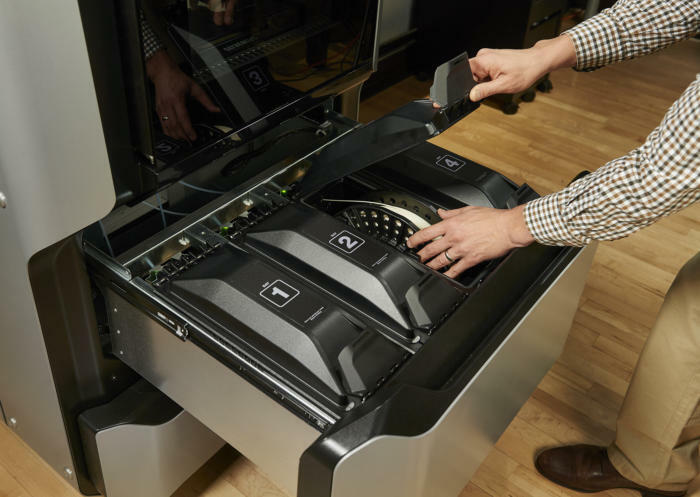 The fused deposition modeling (FDM) 3D printers, which are about the size of a stacked washer and dryer, are designed to be simple to use while also offering fast, precise model creation. The new F123 series office 3D printer from Stratasys. The F123 Series includes three models of printers -- the F170, F270 and F370 -- with build sizes ranging from 10-in to 14-in (25.4-cm to 35.56-cm). Stratasys did not release pricing for the new printers. The Stratasys F123 Series can use four polymer filament in 10 colors to support a wide range of prototyping and tooling applications. For example, the F123's new Fast Draft Mode leverages the popular polylactic acid (PLA) filament to quickly produce conceptual prototypes at a low cost per part. The F123 series can also use production-grade acrylonitrile styrene acrylate (ASA), which is routinely used in the auto industry because it's weather resistant, as well as acrylonitrile butadiene styrene (ABS), which is suited for producing strong, impact-resistant parts. "It's pretty powerful having this much capability in a single system that sits right in our work space," Jesse Hahne, a partner with the Center for Advanced Design said in a statement. "We've tried lower-end 3D printers in the past, and to be honest, they're dimensionally inaccurate. The Stratasys F370 matches the CAD input every time with accurate, high quality prototypes. "The key for us to fast-track product development is getting physical samples in front of our customers as soon as possible," Hahne said. "With our new Stratasys F370, we're able to get brand new iterations in a matter of hours. This rapid prototyping solution has truly become a member of our team." Filament reels allow up to four polymer types to be used in the F123 series 3D printers. The F123 series uses Stratasys' proprietary Insight slicer software, which allows nearly any CAD file to be used, the company said. The exterior design for the Stratasys F123 Series was created with leading industrial design firm Designworks, a BMW Group Company. Most operations can be performed using a touch screen; the 3D printers can also be operated remotely from any networked computer in a shared workgroup and build progress can be monitored from portable devices. Installing and replacing material is equally fast and easy, Stratasys said. Removing a model build from the F123 series 3D printer. "Our inspiration for the design of the Stratasys F123 Series was advanced robotics. Just as robotic tools of the future will adapt to their envisioned usage environment, we worked with Stratasys to create a look, feel and ergonomic design for the F123 Series that would offer expertly crafted user interactions," Andre de Salis, the creative director for Designworks, said in a statement.